The 2015 Chevrolet Cruze and the 2015 Ford Fusion are two of the hottest family-friendly vehicles on the market. The Cruze is a compact car, excellent for city dwellers in need of a fuel-efficient car that fits nicely into tight parking spaces. The Fusion, a midsize sedan, offers a smooth, comfortable ride. Both cars have roomy, features-rich interiors. If you're having trouble choosing between the two, our side-by-side comparison will help you decide which model best suits your lifestyle. The 2015 Chevrolet Cruze is our safety pick, thanks in part to its standard OnStar telematics system. Drivers can count on OnStar to help them out of unwanted situations, with features that include remote unlocking, automatic crash notification, and on-demand roadside assistance. The Cruze LTZ model also comes with a rearview camera to help drivers reverse safely. The 2015 Ford Fusion has a few safety perks of its own. Its standard Ford Sync technology can be paired with a compatible smartphone to dial 9-1-1 after an accident. Parents will appreciate Ford's MyKey, which allows them to set speed and stereo volume parameters for teenage drivers. The 2015 Ford Fusion pulls ahead in this category, but just barely. Its cabin is cut from high-quality materials. A simple design layout creates a clutter-free environment. The available MyFord Touch infotainment touchscreen interface gives the dash a streamlined, modern look. The 2015 Chevrolet Cruze cabin is just as refined, offering driver and passenger supportive, spacious seating accommodations. Cargo space is equal to 15 cubic feet, giving drivers enough room for hefty grocery hauls and road trip luggage. The 2015 Chevrolet Cruze is our pick for comfort and convenience features, thanks in part to its handsomely equipped base model. High-tech standard equipment includes a 4G LTE Wi-Fi connection that transforms the Cruze into a mobile hotspot. Bluetooth phone connectivity lets drivers make hands-free phone calls. Moving up through the five trim models only makes the Cruze more luxurious. Additional highlights include the available MyLink infotainment system, which gives users access to a wide range of apps via a 7-inch diagonal color touchscreen. The 2015 Ford Fusion also comes handsomely equipped. Standard keyless entry saves time in the parking lot. A rearview camera gives drivers excellent rear visibility. Voice-activated Sync technology lets drivers browse infotainment options without taking their eyes from the road. On the road, the 2015 Chevrolet Cruze lives up to its name. The standard 1.8-liter four-cylinder engine makes a substantial 138 horsepower and 125 pound-feet of torque. On the road, it delivers sharp handling and responsive driving dynamics. The available ECOTEC 1.4-liter turbocharged engine delivers both power and fuel efficiency. With 138 horses, drivers can count on this engine to merge seamlessly into traffic and generate oomph in passing situations. With the Eco overdrive gearset in play, this engine achieves 42 mpg on the highway. 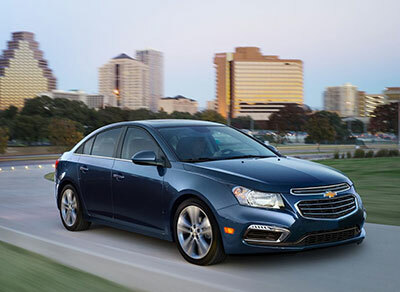 The Cruze Clean Turbo Diesel model gets even greater fuel efficiency, earning 46 mpg on the highway. 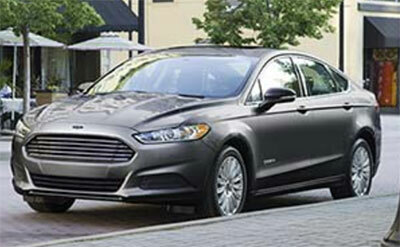 The Fusion's standard engine is a 2.5-liter four-cylinder that creates 175 horses and 175 pound-feet of torque. It achieves 22/34 mpg. Fusion shoppers can choose from three additional engines. The most powerful is a 2.0-liter turbocharged four-cylinder that generates 240 horses and 270 pound-feet of torque. When it comes down to it, the 2015 Chevrolet Cruze gets our overall vote. Its refined interior delivers passenger support and comfort. Drivers can count on modern convenience features to help get them through their daily commute in style. High-tech safety systems work to keep passengers out of harm's way. On the road, the Cruze is both powerful and fuel-efficient.